On 21st July, following an investigation of circus animal suffering and a long campaign by ADI and local animal protection groups, President Alan Garcia of Peru signed into law an end to the use of wild animals in circuses. With this ban, Peru is the second country in South America to take national steps to stop the suffering of animals in circuses, following the ban in Bolivia. Here, we look back over ADI’s six year operation leading up to this enormous victory. Pictured above: Peruvian Congressmen Alejandro Rebaza and Jose Antonio Urquizo, and ADI’s Jan Creamer launch the two bills at the Congress to ban animal circuses. Back in 2005, ADI field officers went undercover, investigating seven randomly selected circuses in Peru. This was part of a huge operation carried out inside circuses across South America – one of our most comprehensive investigations to date. The evidence in Peru showed systematic violence against circus animals,including lions with Circo Las Galaxias whipped and struck with weapons; abuse of a capuchin monkey with Circo Zafari Kids and an ocelot; many animals were subjected to verbal intimidation. The footage also showed shocking levels of confinement and deprivation, including three lions living in a tiny beast wagon, with no access to natural daylight; primates permanently chained down and other animals in tiny boxes. Our Stop Circus Suffering campaign was launched in 2007 with the support of the local groups in Lima. We prepared a DVD and a report that included the results of our investigation in Peru and the other South American countries. The ADI team presented this evidence to the Peruvian Congress and drafted a proposal to ban wild and domestic animals in circuses. The campaign built up a head of steam. 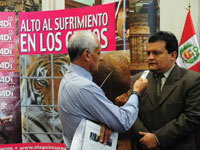 Congressmen Alejandro Rebaza and Jose Antonio Urquizo immediately tabled bills banning the use of animals in circuses, which were joined together and discussed by Congress. In May 2008, ADI produced the report Science on Suffering, with the scientific evidence we would need to back up our arguments. Though we had got off to a successful start, the going was not easy. 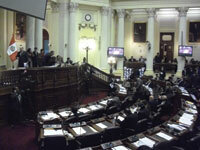 For the bill to become law it needed to be debated and approved in both the Agrarian and the Andean Peoples commissions; selected for priority by the Board of Spokespersons for debate in the Plenary; and finally handpicked by the President of Congress to be discussed on the day. There were many hurdles. We met every member of each Commission and circulated our briefings. The bill was finally debated in March 2009 and approved as an amendment of the National Animal Protection Law rather than as a separate law. The bill was then sent in its new form to the Andean Peoples Commission where it was again approved unanimously in May 2009. The first two hurdles were behind us. We now faced the challenge of getting the Board of Spokespersons to prioritise the bill. The ADI team stepped up its lobbying campaign and held meetings with 100 congress members, whilst also organising a series of events promoting a public petition requesting the bill to be put on the agenda. In May 2010, ADI carried out a new undercover investigation in South America and the latest evidence became the core of a new film titled Unnatural Acts. 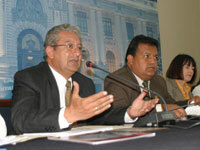 The film was launched in the Peruvian Congress, and the suffering exposed was so horrific that the event received widespread TV, radio and print coverage. We also presented our petition, which by now had generated over 3,000 signatures, to the President of the Congress. The Board listened and, just weeks later, prioritised the bill. Now all we needed was the President of the Congress to pick our bill for discussion on the day. Several Peruvian celebrities – including musicians Julio Andrade, Miki Gonzalez, William Luna, Toxico, and Grammy award winning band Aterciopelado – came out publicly in support of our campaign. After watching a video featuring them speaking out, a number of Congress members personally wrote to the President of the Congress asking him to discuss the bill in the next sessions. A march was also held in the city in support of the bill. However, the circuses weren’t going to give up without a fight. Shortly after the celebrities spoke out, the circuses started lobbying the Congress claiming that our investigation lacked validity. ADI responded quickly with a new video refuting the circuses’ claims, and produced detailed briefings to counter them. At the same time, public pressure was mounting with events in support of the bill continuing around the capital. Pictured above: Congressman Jose Antonio Urquizo is interviewed during the Unnatural Acts launch. As the 2011 Peruvian elections were taking place, ADI met the President of the Agrarian Commission where it was suggested that it might be wise to look at other legislative routes to get the ban approved. After exploring several options, the Commission suggested adding an article on the use of animals in circuses to the Forestry and Wildlife Bill, soon to be heard in the Plenary. Although the Commission did not accept a full ban on wild and domestic animals in circuses (given that the bill was on wildlife only), it accepted some of our amendments and we compromised on a ban on circuses using wild animals. The bill was fast tracked and approved by the Plenary of the Congress on 16 June and signed by the President in July. ADI has now started working with the Ministry of Agriculture, drafting regulations for the implementation of the ban. We will be providing a draft text and carrying out a circus animal census to establish how many circus animals are in Peru. Special thanks to the local groups: Unidos por los Animales (UPA), Amazon Shelter, Perú Antitaurino, Amar, Conciencia Animal and Orca. Pictured above: The debate before the vote, in July of this year. Please send a donation to help fund these campaigns in South America – they rely completely on funding from ADI.